wrapped around a tree. We made use of a logic level converter to convert the 3.3V output from a Pi to 5V. the WS2812B LEDs, specifically the provided Python API. for the checksum (which is CRC % 256). We finally encoded the data through Manchester encoding, to ensure at most there are two successive 1s or 0s. We made use of OpenCV3 via Python3 to perform blob detection. We first thresholded the 720p image frame from the webcam, through the use of the following function call cv2.threshold(frame,200,255,0). 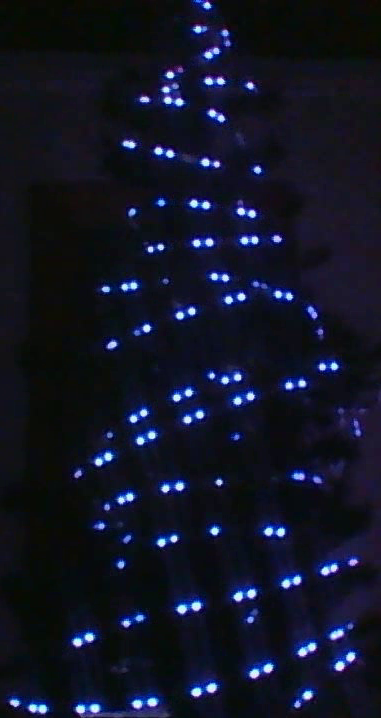 We then made use of cv2.SimpleBlobDetector_create(params) to perform blob detection, to find the LEDs. In the following two images, you can see, the first is the original image from the webcam, the second shows blobs circled with a red circle. The blob detection was performed in realtime from the webcam frames, while the frames where written to disk at 30fps, to enable later processing. the 30fps video we captured previously. For each of the blobs in a frame, we check if a blob has been found within 8 pixels, of the current blob’s (x,y) coordinates, if it has, it is likely the same LED, so we update its (x,y) location, to that of the current blob. We then add the timestamp of the current frame to a list for the LED. If the blob hasn’t been seen before within this fixed distance, we add it. Once we have successfully processed all frames, we are then able to discern the bits of data for each LED from the timestamps an LED was ‘on’. As we made use of manchester encoding, there can only ever be two ones or zeros next to each other. We find the differences, between the frame timestamps, for each LED. We then iterate through each of these differences, if the difference < 60, we count the number of sucessive times we've seen a value < 60. If a blob has been present for <= 200ms, we class the LED as being on, and output a single bit. If it has been present for more than this we output two 1's. Once we have have generated a bitstream for each LED, we then make use of a sliding window to find the preamble which is 32 bits in manchester coding. 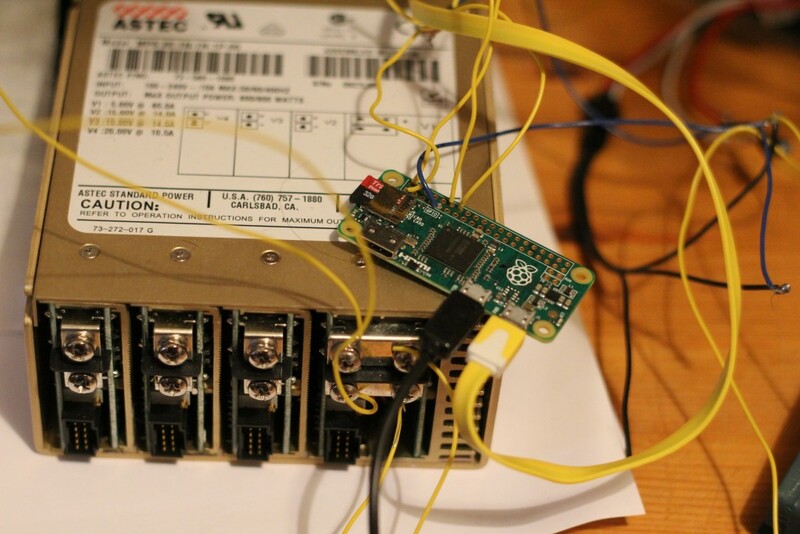 We then attempt to extract the 10 bit ID, and perform checksum computation on the preamble + ID bits, and compare it to the checksum found from the LEDs bitstream. 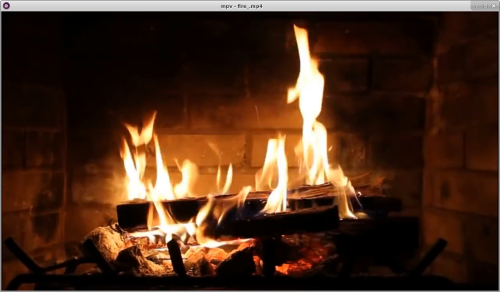 We downloaded a video of a fire, and obtained the colour from the same (x,y) coordinate as the LEDs we detected from the tree. 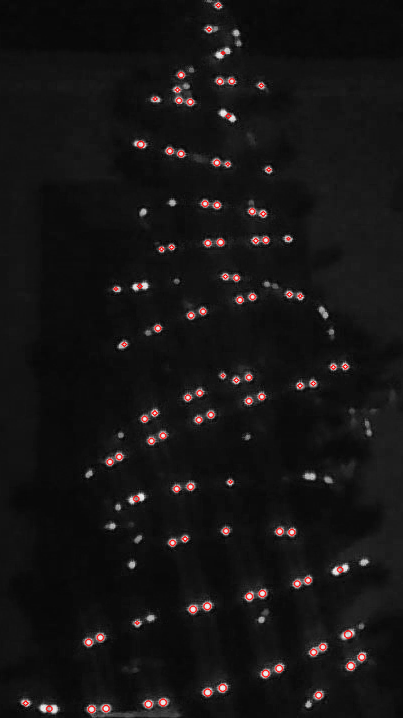 We played around a bit with histogram backprojection to extract colours similar only to a red or green LED, to avoid ever having the LEDs completely off, however more work needs to be performed to represent data through colours. 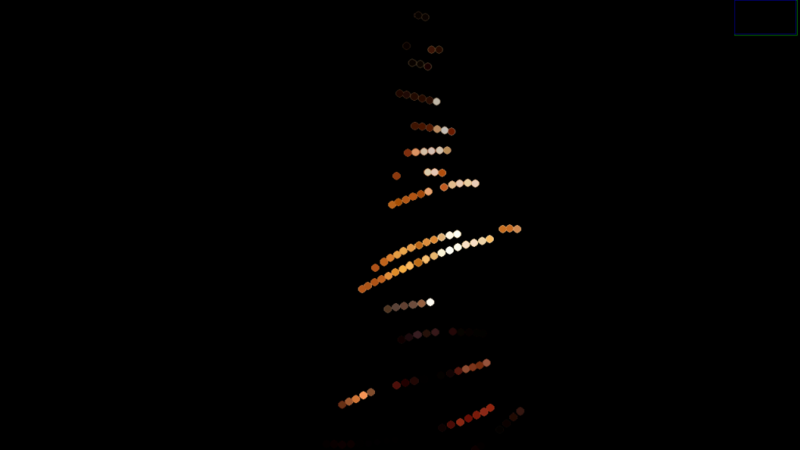 We also intend to create a full 3D model of the tree, to light all sides of the tree.